'(Rupert) Murdoch hasn't got anything really big to drive their TV audiences and Formula 1 would be good for that. They have been trying to buy the TV rights from us for a long time but we won't because they are not free-to-air television broadcasters. They are a subscription service. Sky is doing an incredible job but if you look at their audience figures they are nowhere. Who said this, and when? 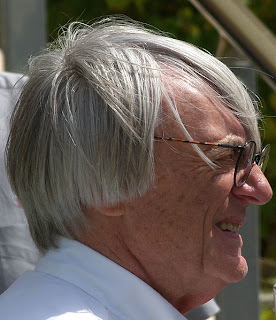 Well, in light of the events of the past two days, it may surprise you that these are the words of one Bernard Charles Ecclestone, and he said it as recently as at the Turkish Grand Prix in May this year. On the other hand, it might not be that much of a surprise. But the problem is, depsite his subsequent Damascene conversion, I think Bernie may have been spot on first time around. Yes, news that UK based F1 fans had feared arrived early on Friday this week. The BBC, the current TV rights holders and free-to-air broadcasters, in a cost saving exercise will only show half of the F1 races and qualifying sessions live in the UK from next year onwards, with all of the races being available live on Sky, a subscription service (with the BBC showing deferred highlights of these races, possibly deferred full races if you believe Martin Whitmarsh but it seems the BBC are denying this). Such a deal had long been rumoured, but that hasn't tempered the anger in response to the actual decision being confirmed. I share this anger, and the anger is mainly on the grounds that I think this decision will result in many F1 fans not being able to watch live coverage of the races for half of the season, with a subsequent marked drop in the numbers who follow F1. And ultimately this will be bad for the sport. Readers from outside the UK may be wondering what the fuss is about, especially if they are in countries where paying for subscription TV is well-established. However, strange though it is to say of a major TV market, paying for TV is still not part of the culture in the UK. Subscription channels first broadcast into UK homes only in 1989, and even now, despite Sky having around 10 million UK subscribers, subscription channels have a minuscule audience share (I read that the biggest audience on Sky Sports from 10 to 17 July, the most recent figures available, was 248,000 viewers for 20/20 Cricket). Watching the free-to-air remains the default for most. And, if you don't have Sky and are interested in watching all F1 races live (and we all know that watching the full race or highlights after the event just isn't the same), then the costs of subscribing in order to have access to every race live are not small: £487 a year for their standard service which includes Sky Sports, £610 for HD. Therefore, with the 10 races you're not getting on the BBC, this works out at upwards of £60 a race! At that level of financial disincentive it's inevitable that F1 will lose a lot of viewers. And it's not like there wasn't an alternative. Channel Four (another free-to-air broadcaster) had the same money on the table for the rights, the Sky option was taken up, apparently because of Sky's experience in broadcasting sport (though possibly sweetened by the £1m per team per year that has been mentioned as being on offer from Sky, which seems to have suitably sedated the team bosses on this). But you wonder the extent that Bernie, and the teams by their acquiescence, have done real long term damage to the sport in return for a short term gain. It also underlines, as if we didn't know it, the extent that the F1 fraternity is wholly out of touch with the wishes of its audience. It looks that, in agreeing to this deal, the benefits to F1 fans and to F1 as a sport more generally in terms of its retention of followers has not entered the equation. Subscription channels' low audience share in the UK is demonstrated by the fact that even Sky's flagship Premiership coverage only gets in the region of 1-2 million viewers at best. Even if you make an extremely generous estimate, which assumes many F1 fans take up Sky subscriptions for next year's F1, you'd think that's still only in the region of 3 million viewers at most. So, less than half than the 6-8 million viewers that the BBC's F1 coverage pulls in right now. It seems to defy all commercial logic to happily lose half of your customer base like that, even if it is in return for a financial sweetener. And to put it into a language that F1 team bosses would understand, that won't be good for their sponsors' exposure. And it might not end there. There are the consequences of the loss of continuity and the subsequent loss of viewer loyalty. I'm assuming that the BBC would never allow half of its Eastenders episodes to be packed off to a subscription service elsewhere, as they'd worry they'd lose these viewers altogether. Same goes for any business - loyalty and continuity are king to continued transactions. Consumers these days have a lot of options on how to spend their time and don't like to be unduly confused or perturbed, and if the thread of watching each F1 race is lost they may be lost to the sport altogether. And the warnings are there. Many point to the success of Premiership football coverage on Sky, and football's growth in popularity at the same time, as a parallel. But I'd suggest that the parallels are elsewhere, and are less encouraging. Football is not the best analogy in this case as it is the staple sport in the UK in a way that F1 isn't, and (with all due respect to The Big Match) live TV club football wasn't really established in this country before Sky came along. Highlights very much was, and crucially this was (and still is) retained by free-to-air broadcasting. Plus in football attending matches in person is much more readily available, and much more part of the culture, than it is for F1. Further, assuming that F1 on TV will establish itself as a collective 'watch in the pub' spectacle, as live football has and some have suggested F1 might on the back of the Sky deal, seems an incredible leap of faith. It's something that's never looked like happening in the past. Boxing, and to a lesser extent cricket, are more obvious parallels for F1: established sports that jumped into bed with Sky and seem to have lost a chunk of their popular following as a consequence. I don't doubt, as many defending the deal have pointed out, that Sky's actual F1 coverage will be excellent, and that they'll put a lot of effort and resource into it. But it rather misses the point. And who's to say it would stop here? The precedent has now been set, and allows subscription channels such as Sky more licence to strike similar deals for F1 coverage in other major markets, as well as for Sky and others to encroach for into F1 UK TV coverage, further elbowing out free-to-air, in the future. This could well turn out to be the thin end of the wedge. Then there's the quality of the BBC's free-to-air coverage itself while all this is going on. No one doubts the BBC's coverage is fantastic currently, but if their priority is spending less money then the resource put into F1 coverage will likely decrease, with clear implications for the amount of of pre and post race coverage as well as for the F1 forum. Word is that they'll be sharing commentary with Sky initially (though not sharing presenting) but what happens longer term is anyone's guess. Whatever the case it seems inevitable that Sky will start waving cheques at the BBC's best talent, such as Martin Brundle and Ted Kravitz. Plus you wonder the extent that BBC journalists can establish relationships with and achieve access to key F1 figures as successfully as they are currently if they're only turning up to every other race, as well as sending fewer people to each. The possibility that the BBC end up proving a rump service free-to-air does not seem at all remote. With all of this in mind, as Giles Richards in the Guardian said: 'Would it have been too much for a sport as rich as this one to have come up with a plan that allowed the BBC to keep its coverage but for the sport to make slightly less money? Sadly, F1 and Bernie don't do those deals'. As I said, the sport's protagonists are risking serious negative consequences for the collective that they operate in, for the sake it appears of keeping up their money rewards in the short term. It seems that people with power in F1 can't see beyond the end of their wallets. There are plenty of reasons to take a dim view of the BBC's role in this as well. We all know that with their latest licence fee settlement that the axe has to fall somewhere, but as with anything where the axe falls is a matter of will and priorities. There is always a choice. And to go to such lengths in opening up a package, that rewards them with high viewing figures, that's thought to cost them £45m per year all in when you're an organisation spending £900m on a move from London to Salford does seem to betray a particularly warped sense of what your public wants from you. But sport is a soft target for them when making cuts, F1 especially so, and I suspect they know it. And the BBC hasn't handled this well. Their initial reaction was to try to claim the deal was a triumph, and once they gauged the wider public hostility their Head of F1 effectively told his customer base that they were all plain wrong to be so outraged (perhaps he missed his calling as a sub editor for Pravda). But if the BBC were under any illusions about how F1 followers would react to the news they shouldn't be now. The said justification received over 3,000 comments, almost all negative, in its first evening (and links to it on the BBC website have since mysteriously disappeared). And in all of this I've been prepared to park whatever misgivings I have about Rupert Murdoch and his media empire that F1 seems keen to be part of. Judging by the content of internet forums this is also a concern for many current F1 fans, who wouldn't consider paying for a Sky subscription even if they could afford to. If nothing else it is spectacularly bad timing, what with everything else that's been going on lately, and further demonstrating F1's ability to ignore how it's coming across more widely. Of course, there now seems almost nothing that can stop this deal. The teams have been sedated with some cash as mentioned, the Concorde Agreement, via the usual devil in detail, has been surmounted and Bernie, the BBC and Sky have cut a deal that they show no signs of wanting or being able to go back on. I just hope now that I'm totally wrong and that the terribly clever people in F1 who've allowed this to happen know exactly what they're doing and aren't just following the short term financial gain in return for serious long term adverse consequences for the sport's health. But I fear that my misgivings are well-founded. In one hundred years' time when someone writes the history of F1's following in the UK, and even its following more widely, 29 July 2011 may go down as a black, black day. A 'suicidal' one, as Bernie might have said. the first blog that i think sums up exactly how i feel. the arrogance of how the announcement was made just insulted the fan base (and exasterbates the reaction), being told whats best for you when it so clearly isnt from your own point of view. If the BBC couldnt afford coverage they should have opted out. everyone expected that next year would probably be the last, we did not however expect it to end this year. if you compare what the BBC has now to what it will have, its a very poor deal in my opinion. next year: non exclusive, no free practice, and only 10 live quali and races, with highlights of non live. effectivly this isnt even half the equivelent coverage but they've paid 2/3rds of the money. its a terrible deal for the licence payer and dosnt compare to the value for money they currently get. i think the fans would have understood if they had said they couldnt afford it, it would have been all bernies fault if it then went to payed tv. and people keep saying how good sky sports coverage will be. But, and this i feel is a critical point, how will something be if no-one sees it? each F1 team spends in excess of £40m, with an extra £1m from this deal, i presume the sponsors who pay the rest will be happy to have less exposure to their advertising... i think not. Hello. Just a couple of points. I don't know how it would work in England, but I can't imagine F1 being shown in pubs up here when on of the Bigot Brothers are almost always on TV on Sundays. I can imagine the reaction if I asked them to switch off Rangers v Whoever to put on the F1. Will pubs show Stoke v Wigan or the F1, do you think? Secondly - 5508 comments and counting on BBC site! Sky may have 10 million subscribers, but they are spread very thinly: Sky has three other sport channels, plus Sky Sports News, plus ESPN, etc. BBC got a 47% audience share for teh German Grand Prix, and that sort of share hardly ever happens these days due to the sheer number of channels - Eastenders gets the highest audeinces in the UK (don't know why, as it's rubbish) and their audience share never gets above 30%. I also read with interest that the Channel 4 (or even 5) deal was a goer but the BBC wanted a joint deal with Sky as they are not a direct "rival" to the BBC as they are not a fellow terrestrial channel, so they jumped into bed with Sky to keep the coverage off other free-to-view channels. Pretty shocking if true. And finally, a slightly mischievous question: would you get Sky now? Thanks very much for the comments guys. Appreciated, and I agree with the points you raise. Another thing is that the BBC F1 deal is only three years old. In which case, if it was so marginal financially, why did they agree to it in the first place? It was hardly unforeseen that a future Government was going to freeze the licence fee. And if the thing is true about the BBC pairing up with Sky so to scupper other free-to-air bids then they've conspired against the interests of F1 fans frankly, and it would be a disgrace. Thing is, I probably will end up getting Sky if it's the only way of getting live F1, but I appreciate that a lot of people won't or can't. Insightful and balanced views as always! While i share your points, and the point of others in this, my biggest concern is the quality of the broadcast that Sky will offer. Rightly, Sky have ruled out advertisement breaks (ITV got hammered on that! ), BBC offer world-class coverage and have done a superb job with their coverage of the race weekend. Sky have a habit of sensationalising everything they cover. Just look at the adverts for Premiership football...Stoke vs Bolton is made to sound like a must watch game!! I fear the quality will really suffer as like you say, they tempt BBC pundits to their new offering. F1 has made such huge inroads in the UK market tempting non-F1 fans into watching the sport, all for it to go to waste. Sad news from my point of view. Oh, and i subscribe to Sky but there is simply no way i will watch their coverage over the BBC's! 8300+ comments on the "head of F1"'s blog and counting. It's almost surreal - I still can't quite believe it's happened. If some salesman in a shopping centre comes up to me and asks if I'd ever considered Sky, he'd better be wearing a cricket box. Thanks for this kind words! Actually, the one thing in this case that isn't particularly worrying me is quality of the Sky coverage itself. Their sports coverage is invariably excellent and I don't doubt they'll put a lot of effort and money into their F1 coverage, especially as you'd have thought F1 will be their flagship. You're right that it'll probably be more sensationalist than the BBC's coverage is, but you'd expect that. Who knows, the sensationalism may even tempt a few new people into following F1! You're also right though that Sky will have to go some to be as good as the BBC's current coverage. It's everything else virtually about the Sky deal that worries me! You don't have to get Sky. RTL.de do an excellent feed with commentary by Nikki Lauda and if you can't understand German you can listen to 5 live so you get it free and SKY get a headache. Or you can buy a dish and receiver cheap and point is to pick up any of the Free satellite broadcasts of F1. More ways to skin a cat than they think. I won't be watching Sky as I won't entertain any Murdoch family products in my house. Yes David, it's still a bit hard to imagine half the races won't be free to air on TV next year - it's not totally sunk it yet. And it's amazing the amount of comments that blog has got so quickly, even after the link was taken down! The BBC should be under no illusions about the anger out there. I've just watched 3 videos on the BBC Sport website - Ecclestone's statement, Martin Whitmarsh's reaction and Murray Walker's thoughts. Whitmarsh was made to look a fool, stating that the 10 non-live races would be shown in full, albeit delayed. Ecclestone said they'd be 1hr highlight shows. When asked why Whitmarsh thought they'd be shown in full, he said "that's what I told him". I had thought that Ecclestone was a cheeky chancer, now I see that he's a liar and a cheat. Murray defended the BBC loyally, but neglected to mention that they'd vetoed C4's offer which equalled Sky's and would have kept full coverage free-to-air. F1 will go the way of the WRC. In 20 years, no-one will care any more. You're obviously not angling for a paddock pass from Bernie then :) In all seriousness its refreshing to read something written eloquently that doesn't ignore the all to obvious pitfalls and disadvantages that accompany the sky deal. The BBC will need to do far more than simply bury the link to the blog where the (so far) 8,360 comments are 99.9999999% Negative, and the feedback has been non existent, despite the standard bbc reply to a complaining email stating that that particular blog is to encourage debate!. I commend you on your blog, and for having the courage to tell it like it is, in a balanced manner, the BBC wouldn't know balance if it arrived courtesy of one of the taxi's they spent 13Million pounds on last year. Graham, Thank you for posting a very well thought out and succinct article. I am just one of the many people who have posted comments on Ben Gallop's BBC blog and had some removed as well like many others. Like you I have desperate fears over this deal and although I'm lucky enough to be able to afford Sky I won't be subscribing to Sky Sports. I have no interest in any sport other than F1 and will not pay them to line the Murdock family's pockets. Thanks very much for your nice words all - glad you like the blog article. I'm struggling to find UK F1 fans who aren't really worried about this deal, either about the cost to us to watch F1 or the impact it will have on F1's popularity more generally. It's a pity that the BBC haven't handled this matter particularly well, as I'm generally a fan of the BBC and of their F1 coverage especially. I would have much rather they'd fronted up on this and 'felt the pain' of F1 fans a bit more (as well as offered a bit of reassurance), and I believe that F1 fans would have respected that. Telling us that we're all wrong and that the deal is marvellous and/or inevitable (as well as running from the debate as many of you say) was always going to put people's backs up, and we're now seeing that. David - yes, you're right that the team bosses seeming to not have the full story on this doesn't look good either. This whole case doesn't say much about the power of FOTA either - it seemed the teams weren't consulted at all about the deal and also seem to have rolled over since it was announced. Superb piece, you have distilled the thoughts and fears of 8000+ respondants to Ben Gallop's blog into a few insightful paragraphs. However, given F1's historically turbulant dynamic both on and off track, do you envisage any potential for a reversal of fortune for the free to air F1 fan? Or do you think that The BBC's timing and refusal to even enter into debate, indicate an irreversible situation; that they are prepared to simply ride out the storm? Excellent piece; thank you. The deal shows that Ecclestone just doesn't care about the fans and thinks only about his wallet. I think the way forward is to do as Dave suggested and go the RTL.de/Five Live route. We get live coverage, Murdoch doesn't get our money and Ecclestone is made to look a fool. Other thing that bothers me is the loss of free practice sessions. Even if they are on sky, its not like you can watch them live if your at work. At least with the BBC you can put it on in the background and listen - with the odd peak when your boss isnt looking! I can watch sky on my laptop but i dont think sky like it when you try to log into Sky Player on multiple computers. So im going to miss out massively on the key insights about the cars, tracks, bigger F1 picture provided my Crofty and Anthony Davidson. So its either time off work to watch them, or just sit and listen to 5Live - assuming anything is even covered. If i can log into my Sky account at work, i'll send you my passwords! Thanks again for the comments everyone, as well as for your nice words about the blog post. In response to v63amg's question about whether there's any going back on this deal, I'm afraid I don't know for certain, but I also very much doubt it. I don't know because I haven't seen the contract/deal that's been agreed, and even if I did I'm not a contract lawyer so wouldn't be able to work out if there's any potential for anyone to cancel the deal (if I was a lawyer I'd be charging you all for saying this - ho ho). But I would have thought that there's no going back, and that Bernie wouldn't have announced this deal unless the it was all signed and irreversible. So, I suspect even if BBC has been shocked by the public anger over this deal there's not a lot they can do other than grin and bear it. And even if the BBC try to renege on the deal, I can't see Sky meekly surrendering F1 TV rights that they've been fighting for for years, can you? And none of BBC, Sky nor Bernie have shown any sign of wanting to go back on the deal so far, not publicly at least. And now that the precedent has been set of pay/subscription channels showing live F1 races exclusively in the UK, it's hard to see the genie being put back in the bottle in the future. Never say never though. When I first heard about this deal I thought the only hope of stopping it would be if the teams/FOTA vetoed it, especially as the Concorde Agreement apparently guarantees free to air F1 coverage in major markets. But as I said, the teams appear to have acquiesced to it. Matt - you'll get yourself sacked from your job with that sort of admission! In seriousness, yes while Sky are usually pretty big on online coverage and I can't imagine they wouldn't show practice sessions online, I'd have thought it'll need some sort of login to watch coverage online with Sky, rather than as a free to all like the BBC's online coverage currently. Thanks for your comment. I'm afraid I don't agree with you on that one. I'm a really big fan of the BBC's pre and post race coverage, and think it's excellent and well beyond the call of duty. And I also think Jake Humphrey's done a great job presenting F1 as well. I am sorry to say that if I have to start paying for F1 races, I will not pay for it, I love F1 but I am on a Disability pension and don`t have the extra money to pay for it. Sorry one lost F1 fan.